One of the many incredible sights you're likely to encounter on a trip to Mongolia. Photo courtesy Nomadic Expeditions. The insider advice on this page is from Wendy’s Trusted Travel Expert for Mongolia: Jalsa Urubshurow of Nomadic Expeditions. 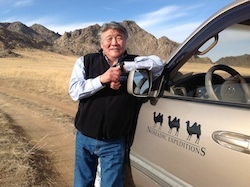 A Mongolian-American who grew up in New Jersey, Jalsa founded Nomadic Expeditions in the 1990s, using the proceeds of his successful construction business to bring tourism to a place—Outer Mongolia—that was once synonymous with the end of the earth. He was among the first to offer highly customized trips there, and also created one of the country’s original guide training programs. 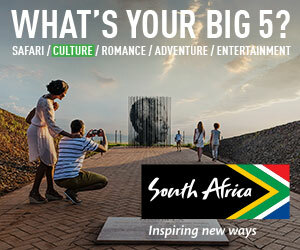 Jalsa doesn’t simply design itineraries that cross off sights on a checklist; he pairs travelers with experts—including historians, scientists, artists, and photographers—who give visitors a comprehensive understanding of the country’s history, culture, and traditions. Now splitting his time between Mongolia and the U.S., Jalsa has been an advisor to all seven of Mongolia’s prime ministers and two of its presidents, a role in which he champions sustainable, eco-friendly travel as a viable alternative to Mongolia’s mining-based economy. Riding horses with Kazakh hunters is a once-in-a-lifetime experience. Photo courtesy Nomadic Expeditions. Travelers often ask to skip Ulaanbaatar, but Mongolia’s capital has quite a few attractions worth visiting. The National Museum of Mongolia and the Fine Arts Zanabazar Museum showcase both ancient artifacts and contemporary artwork by local artists, and there is a thriving gallery scene as well. The National Folk Song and Dance Ensemble, which was first formed by Kublai Khan and resurrected after the communist period, performs at the state theater during the summer. You can also shop here for the world’s finest cashmere, along with traditional felt slippers and fur hats. Choijin Lama Temple, in the heart of Ulaanbaatar, is a hidden gem of history and architecture. The temple’s museum houses various Buddhist artifacts dating back to the 19th century, as well as thangkas (paintings on silk or cotton), a comprehensive collection of tsam masks, and several masterpieces by famed Mongolian sculptor Zanabazar. 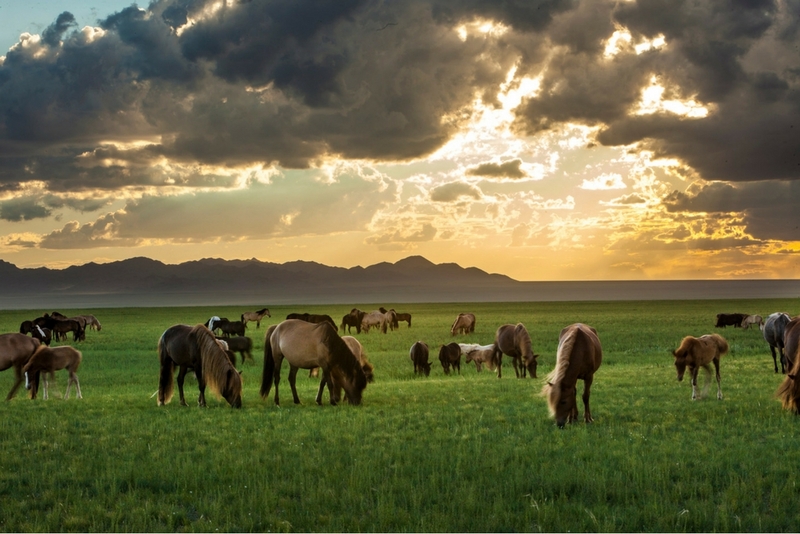 Mongolia offers several fabulous outdoor options: horse trekking through the northern region’s spectacular forests and meadows; hiking the Altai Mountains in search of the snow leopard; or riding horses with Kazakh hunters while their Golden Eagles hunt rabbits and foxes. Many of paleontology’s greatest finds have come from Mongolia, and scientists continue to hunt for fossils here; Nomadic Expeditions not only offers entrée to their remote work areas (and sets up luxury camps nearby), but also provides behind-the-scenes access to the Paleontological Lab, part of the Natural History Museum in Ulaanbaatar. This underfunded museum has been closed for some time, but our guests are welcomed into the rooms where paleontological treasures are kept, and where scientists toil away toward the next big discovery. Although most of the country’s Buddhist monasteries were either destroyed or converted into museums during the Stalinist purges of the 1930s, Ulaanbaatar’s Gandan Monastery continued to operate as a showpiece for government officials. We can arrange a private blessing with a senior lama there. Three Camel Lodge. Photo courtesy Nomadic Expeditions. The just-opened Shangri-La in Ulaanbaatar provides five-star accommodations and service (the latter can be lacking at the city’s more historic hotels), and with a sensible price tag. A true luxury property, it has a magnificent porte cochère and lobby, and well-appointed rooms. 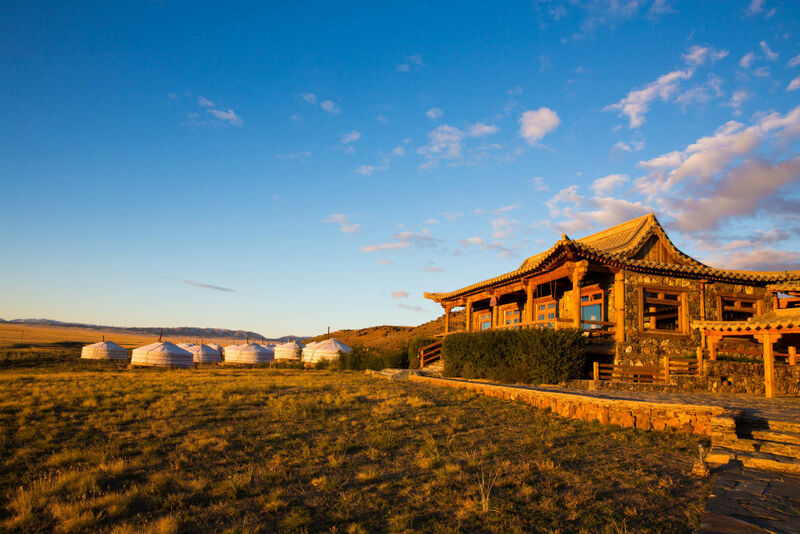 The complimentary breakfast and cocktails in a private lounge make the slightly more expensive Horizon Club rooms a good deal for many travelers transitioning between the comforts of home and Mongolia’s remote—and sometimes rough—countryside. Slightly north of Ulaanbaatar, Terelj Hotel and Spa lies in a beautiful river valley adjacent to Gorkhi-Terelj National Park. This pristine setting is matched only by the creature comforts (marble bathrooms, Mongolian cashmere blankets, Egyptian cotton linens) that draw many members of parliament to these posh rooms. The spa is respectable, though perhaps not world-class. The Executive Rooms are a bit small, so if you want space to spread out, opt for a Superior Room or a suite. Further south and set within the serene Gobi Desert, the award-winning Three Camel Lodge (full disclosure: Nomadic Expeditions owns it) is an eco-friendly and luxurious take on gers, the traditional felt tents used by nomads. Besides providing the only high-end accommodations in the Gobi Desert, our lodge also runs anti-poaching patrols, started a children’s club, and helped local families develop farms that provide food for the nearby ger camps. Currently, the lodge’s standard gers share bathing facilities in the main building, but by 2016 every ger will have its own stone shower. Note that the traditional ger design doesn’t allow for windows—but every door opens onto a lovely view of mountains or desert. Huushuur: traditional fried dumplings usually filled with meat (nowadays, you can sometimes find them filled with vegetables). They’re available throughout the country in cafés and restaurants, but they are especially memorable when sampled at the table of a Mongolian family. Early June is ideal for avoiding crowds, while the temperate weather of late August through September is perfect for camel trekking. 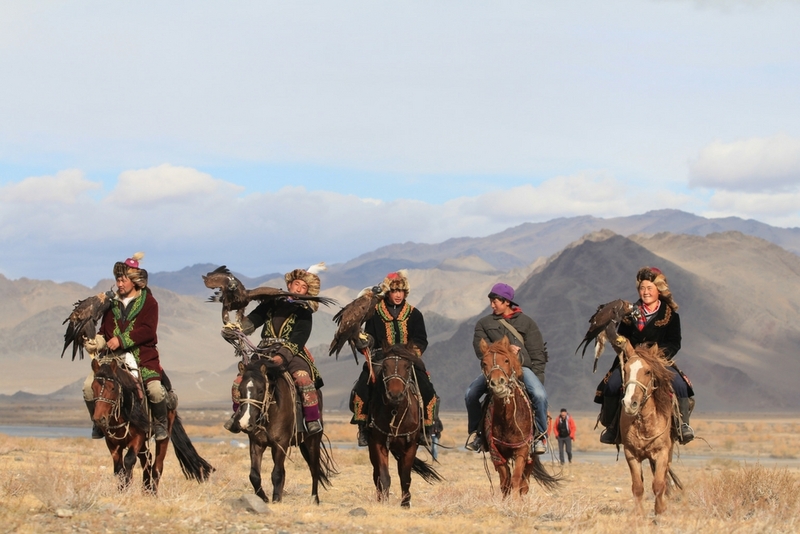 The Golden Eagle Festival, a Kazakh hunting tradition in the Altai Mountains, is held annually in early October. Winter in Mongolia can be harsh, so avoid December through April. Many ger camps are also closed during this time, limiting accommodations. It is illegal to remove fossils from Mongolia—but that doesn’t stop people from attempting to sell them to unsuspecting tourists. Not allowing enough time for traveling within the country. All domestic flights originate in Ulaanbaatar, so you are constantly returning to the capital in order to get from one region to another. To make matters worse, flights are often delayed and canceled. Assuming that the Naadam Games—a festival of traditional sports such as horse racing, archery, and wrestling—are exclusive to Ulaanbaatar. Festival events are held all over the country. In the capital, the games are an increasingly touristy and grand occasion, a kind of national Olympics—but in smaller locations travelers can have a more immersive cultural experience, with competitors arriving on horseback and families gathering to celebrate the summer season. When you first arrive in the country, make sure to book the V.I.P. greeting service at Ulaanbatar’s Chinggis Khaan International Airport. This service allows travelers to bypass the lines at passport control and baggage claim. Tipping is not customary in Mongolia, but many in the service industry have come to expect it from foreigners. If you choose to leave a gratuity, it should be about 5 to 10 percent. The Mongolian climate is extremely dry, so moisturizer and Chapstick are essential. Check our blog for a few other useful items. Don’t miss sunset on a clear day at the Flaming Cliffs in the Gobi, when the sandstone glows bright orange. Colorful Kazakh tapestries crafted by locals in the Altai region, and sold throughout the country. Muslim Kazakhs have lived in this province for centuries, making it the only part of this majority Buddhist country that is not ethnically homogeneous. Mongolian vodka is the smoothest in the world, by my estimation—it’s often distilled as many as 10 times. You’ll find dozens of brands, many playing off the notoriety of Genghis Khan.